A Sikh-Briton community organization and United Kingdom’s Defence Secretary Michael Fallon have signed the Armed Forces Covenant, formally recognising the strong historical and contemporary ties between the community and the British Armed Forces. The Covenant was signed at an event to celebrate Vaisakhi with the British Sikh Association on Thursday, March 23, 2017. The Defence Secretary said: “A diverse military is a strong military, which is why we’re committed to making sure our forces better represent the society they serve – this covenant signing is yet another demonstration of this. Currently 170 Sikhs serve in the Royal Navy, Army and the Royal Air Force, with many more serving as reservists. A poll by the British Sikh Report, published on Tuesday, found that 69% of Sikhs would support their child taking a career to defend the nation, an official release said. The signing of the Covenant is considered a demonstration of the commitment to ensure a more diverse force. The Ministry of Defence said it was aiming to ensure 10% of recruits come from Black, Asian, or Minority Ethnic (BAME) backgrounds by 2020. BAME personnel currently comprise nearly 6% of new recruits. “The Armed Forces Covenant is a commitment from the nation, enshrined in law, that those who serve or have served, and their families, are treated fairly and not disadvantaged due to their service,” the release added. 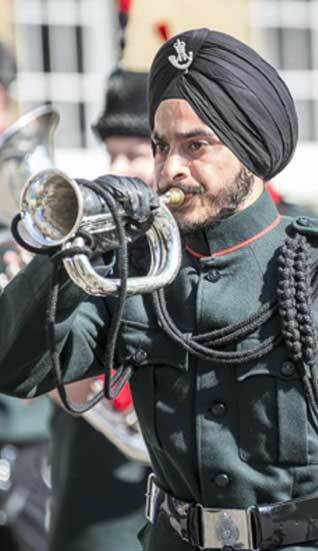 Role of Sikh-Britons In Their Nation’s Armed Forces"